Oh, the joys of a small motorcycle! That’s the first thing I thought, as I took off down the street on the diminutive 2016 Honda CB300F—so light, so narrow, so not a handful. Yes, sometimes that truly is what you want, especially if you’re a newer rider, or not particularly tall. I’ve been riding for 30+ years, and my inseam is 30.5-inches, but even so, I’ve been having a total blast on the CB300F. There are various obvious advantages to a physically smaller bike. At just under 350 pounds, the CB300 doesn’t outweigh you by nearly as much as mid-size motorcycles. It’s also not very tall, with a relatively friendly 30.7-inch seat height (a 1.25-inch lower seat is available from Honda Genuine Accessories). With its slender physique, the Honda single cylinder is an easy bike to handle in parking lots and slow speed situations. Despite its small displacement, the CB300F is an inspiringly capable ride. The liquid-cooled DOHC single is moderately oversquare, and has a 10,500 rpm redline. Novice riders will appreciate the ease of getting the bike moving with the useful, low-end torque, and everyone will enjoy the healthy mid to upper-mid range power where the CB300F really shines. The power delivery is broad, from a nice pull at 4000 rpm, up through 6500 where it flexes its 286cc of muscles, all the way up to about 8000 rpm, at which point it starts leveling off. The CB300F’s responsive and willing nature, along with its ease of handling, encourages an enthusiastic ride. The ergonomics fit my 5’ 6” frame like a glove, and for somewhat taller riders there’s room to push back against the stepped passenger pillion. With its sport—not supersport—ergonomics, I feel like I could drain the tank before I’d need to stretch my legs. Of course, I wouldn’t be riding it in the manner that returns the claimed 78 mpg—good for 250+ miles with its 3.4-gallon fuel capacity. 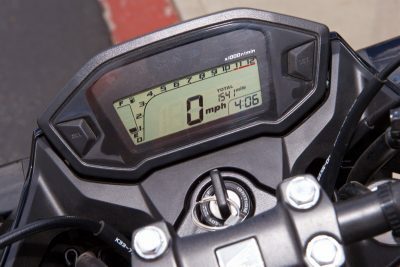 No, that impressive mileage will not come from riding the CB300F hard, but it’s hardly the kind of bike you’ll ride in a sedate manner—unless you want to. This is one of the essential attractions of the bike—it’s not intimidating, neither from a power standpoint nor a physical one. As such, you are the master of the motorcycle, encouraged to push yourself, explore your limits, all within the confines of a small predictable powerplant. It’s perfect for novice riders with sporting intentions, and a play date for seasoned riders. The CB300F makes a great commuter if you ride in tight traffic, especially if you can legally split lanes on the freeway. The bike’s small stature allows you to sneak through the narrow spaces left by sloppy drivers peeking at their cell phones, but you’ll have to be extra vigilant. You are much easier to be overlooked, no one is going to hear the quiet bike coming, and you can’t squirt away from danger as quickly as on a mid-size bike. Hand and foot controls are within easy reach and operate as smoothly as you would expect on a Honda. The brake lever, however, is not adjustable. When traffic is not an issue and you’re going full throttle on the freeway, the Honda CB300F feels stable, even on rain-grooved pavement. Straight-line transitions feel a bit rough, as the 110/70 x 17 front IRC Road Winner RX01 is a bit narrow, but they don’t unsettle the bike. It’s a naked bike, but much of the windblast flows over your helmet when you lean into a natural riding position. The bike is capable of running beyond the legal speed limit, but as you push past 70 mph you’ll hear the engine working hard as it moves into the 8000 rpm range. There’s no single-cylinder buzziness even at these higher rpms, thanks to the counterbalancer. Simply rolling off the throttle taps significant engine braking from the thumper. However, for immediate braking action, the 296mm front disc takes care of business. The bike is ultra light, so dual discs are unnecessary and would add unwanted weight. There’s no unexpected initial bite—perfect for less-experienced right hands. The rear brake is dialed in, and useful for slower speed situations. Suspension is basic—only the shock is spring-preload adjustable—but gets the job done. The 38mm forks don’t flex when braking hard into turns in the canyons, and the 300F’s light weight and narrow physique make it easy to flick the CB300F through S-turns like your favorite Moto3 riders on their Honda NSF250RW racebikes. Rake is fairly aggressive at just over 25 degrees, the wheelbase short at just over 54 inches, and the tires narrow (140mm in the rear), but because of the CB300F’s light weight, low center of gravity, and modest power, it doesn’t feel nervous or unpredictable. For the intended audience, cornering clearance is not an issue, despite the modest 4.7 and 4.1 inches of travel, front and rear. At the speeds attainable on the CB300F, the IRCs feel secure on the asphalt. An aggressive rider will find the tighter it gets, the more of an advantage he has over foes on larger displacement bikes. Of course, once the road opens up, the big boys will quickly dust the CB300F. Honda didn’t mess with a winning recipe, the 2016 CB300F returns with all our favorite ingredients for a great small package sport bike. Novice riders will be encouraged by the bike’s responsive and predictable handling as they develop their sport riding skills, and seasoned riders will enjoy pushing the bike to its limits. If you’re looking for a thrifty commuter or urban runabout, the 2016 Honda CB300F may be right for you, regardless of your riding experience. Plus, if canyon runs are on the menu, the CB300F will also willingly participate and easily satisfy a new rider while putting a smile on the face of experienced riders who can truly exploit its agility.